Set Up: Make a "Cross" of cones, with the outside cones 10-15 yards from the middle cone. One player facing N and one play facing S at the center cone. One player on the W cone and one on the E cone. All other players split up evenly between N cone and S cone with balls. Activity: 1) Players on N and S cones play ball in to player facing on center cone and follow pass. Player on center cone opens up to right to receive ball and play pass to player on outside cone and follows pass. That player then receives the ball and dribbles with speed to back of furthest cone. As soon as final pass has been made and end player reaches center cone, next pass comes in. Switch directions to left after desired amount of rotations. 2) Players on N and S cones play ball into player facing on center cone. Instead of following pass immediately, first player moves just outside to receive a return pass from center cone. 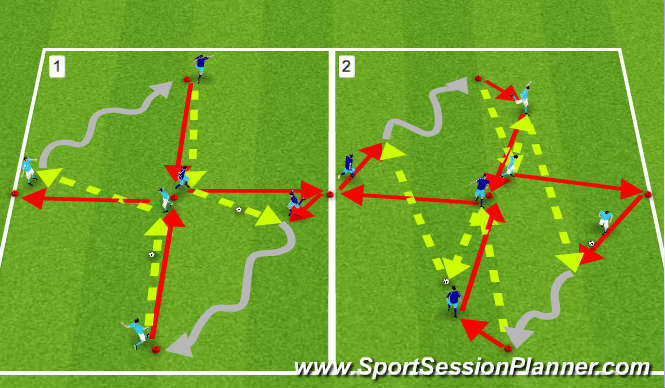 Center cone player then sprints to outside cone while End cone player plays through ball to outside cone player making a run. End cone player then goes to center cone. Coaching Points: Qualities of a good pass, taking a good first touch that leads the player to their target, timing runs, checking shoulder, awareness of next pass coming in.